Rebecca Peterson, age 100, of Boone and the Westhaven Community, died Thursday, September 27, 2018 at Westhaven. Per her wishes, she has been cremated and a private family graveside service and burial will be held in the Sheldahl Cemetery in rural Sheldahl at a later date. Rebecca Helen (Knezevich) Peterson was born March 22, 1918, in Boone, Iowa the daughter of Gust and Manda (Korch) Knezevich. She graduated from Boone High School in 1936. Rebecca was united in marriage to Glen H. Peterson on December 24, 1940 in St Joseph, Missouri. After their marriage, Rebecca was a homemaker for her family and she worked from her home for Donnelly’s in Ames. After her children were raised, she worked as a secretary for the Boone County Sheriff’s Office and the City of Boone in the Water Department. She retired from the Boone Water Department in 1980. In her free time, she enjoyed baking cookies and breads, doing crossword puzzles, and knitting and crocheting. Rebecca and her sister, Millie, knitted gloves and hats when they volunteered to fill the glove three at the church. 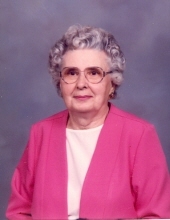 She was a member of the First United Methodist Church in Boone and the American Legion Auxiliary in Boone. Rebecca is preceded in death by her husband, Glen; her parents; her siblings, Mike, Joe, Marie, Millie, Draga and one sibling in infancy. She is survived by her two children, Brian (Denise) Peterson of Madrid and Carol (Jim) Beckwith of La Mars; two grandchildren, John Beckwith of Ames and Danielle (Jason) Kohl of Blairsburg; and three great- grandchildren, Mckenna, Kaylee and Kendra Kohl. To send flowers or a remembrance gift to the family of Rebecca Peterson, please visit our Tribute Store. "Email Address" would like to share the life celebration of Rebecca Peterson. Click on the "link" to go to share a favorite memory or leave a condolence message for the family.